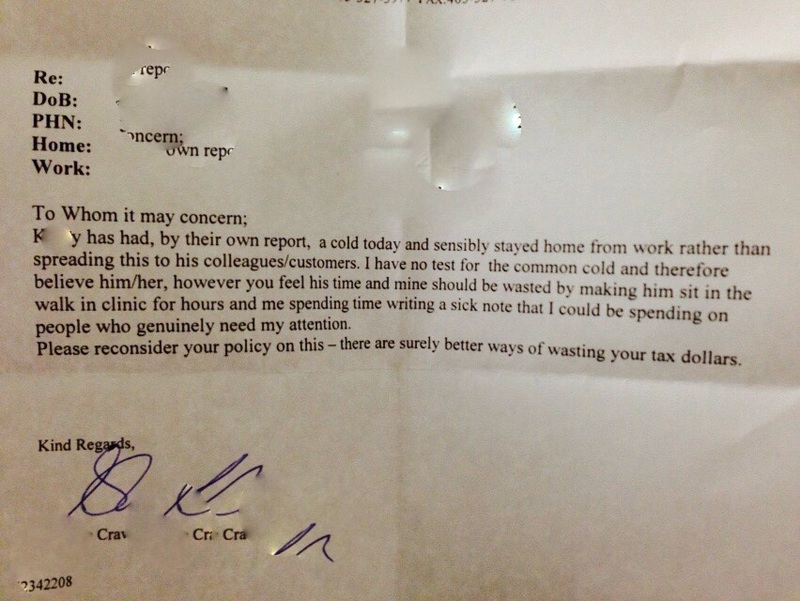 This Workplace Required A Doctor’s Note For ANY Sick Time Taken…The Doctor Is ANGRY! Treating employees like children is a quick way to make a lot of physicians angry – especially at busy walk-in clinics – and this doctor has had enough! In some workplaces, the policy of rproviding a doctor’s note for an absence is still required. Not only does it waste the doctor’s time, it wastes the employee’s time and usually has a hefty fee for acquiring the note at a clinic when they should be recovering at home (according to this physician, at least). When the employer demanded this note, they couldn’t have predicted that the doctor would write this sassy note in response! When the note was posted online, people ate it up! Being able to have the doctor say everything they couldn’t (without the fear of getting terminated) resonated well with the public. Sick time is issued for a reason, and many places have altered their “sick note” policy to kick in after a period of 5 sick-days in a row…but this employer wanted a note for a simple cold. What do you think of this doctor’s angry reply?